A major heat wave hit Atlanta about May 22, 1908. Temperatures rapidly climbed into the upper eighties; not full summer temperatures, but formidable enough given that there would be no air conditioning for many years yet. On May 23rd, the Atlanta Constitution trumpeted, "Scorching Heat Has and Will Continue to Prevail Here." At that time, Georgia Tech students were required to wear full suits to class each morning, Monday to Saturday. After lunch, they would change into overalls to work in the shops, where they applied the theory they were learning in class to practical engineering projects. We, the undersigned members of the Sophomore class do most respectfully petition that we be allowed the privilege of removing our coats during class room work. We ask this after a deliberate consideration of the matter and discussion with several of the professors. We believe that greater class room efficiency of both instructor and student will be secured by the removal of the discomfort occasioned by several consecutive hours of black board work. This physical discomfort interferes with the best mental effort. We do not believe that the absence of coats will show a lack of discipline, or any slovenliness, but just as our overalls have become in the shops a style of uniform, so shirtwaists and belts will identify us with the earnest and business like class room work for which our institution is famous. The petition was signed by fifty-six out of eighty-seven sophomores, plus four juniors and two seniors. It was presented to the faculty at their normal Thursday afternoon meeting on May 28th. The temperature hit ninety degrees that day and the students were hopeful that the faculty would see their request as reasonable and grant immediate relief. The faculty decided to table the request for one week. The sophomores were quite incensed that the faculty did not consider student discomfort an urgent matter and decided to make a united stand. Their first class Friday morning was Physics. They walked in carrying their coats and took their seats with the intent of leaving the coats off. Professor Edwards ordered them to put their coats on and they grudgingly complied, but were not interested in settling down for his lecture. They tried to reason with him, to ask why the coats were necessary and why the faculty was delaying. Professor Edwards was completely unwilling to discuss the matter and warned the class that there must be no further disruptions. Four of the students were too slow settling down, so the professor submitted their names to the faculty for discipline. C. A. Collier for continuing to talk after a general warning to the class. F. B. Atkinson for irrelevant remarks. R. C. Lightner [for] engaging in disorder and failing to take his seat promptly when told to do so. F. S. Jacobs [for] asking irrelevant questions in the class room. Each of the students was assigned an offense. Unless specifically specified as permanent, offenses only lasted for a semester, but having three of them at a time resulted in expulsion. Friday was almost the last day of ninety degree weather. The heat wave broke and temperatures fell several degrees. Everyone breathed a little easier, but when the next faculty meeting came around, there was no heat wave to justify further consideration of the sophomores' petition. It is not mentioned again in the Faculty Minutes and there is no record that they ever considered it again. The faculty did keep the petition, however. It can be seen at the Georgia Tech Archives. 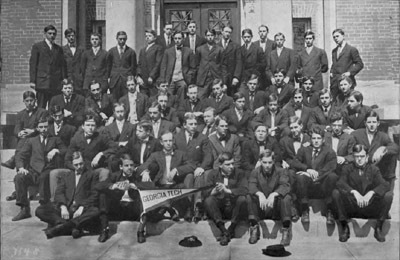 Above, the 1907-8 Sophomore Class in their suits. 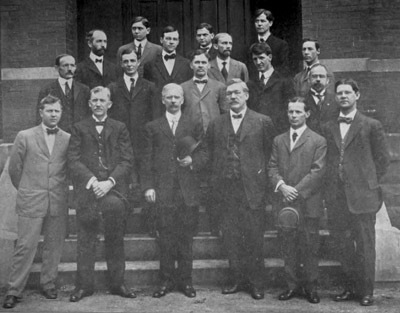 Below, the 1907-8 Faculty, similarly attired. Both images are from the 1908 Blue Print. Among the sophomores who signed the petition were Dean Hill, captain of the 1910 football team and establisher of what became the Heisman Trophy, and Jack Thiesen, who would serve as Executive Secretary of the Georgia Tech Alumni Association from 1922 to 1951. Georgia Tech Alumnus, Spring 1972, p. 21 "The Petition of '08"